We are very happy to report that we have completed our first two spay & neuter clinics! Barrio Nuevo is one of those poor neighborhoods so common in developing nations. These Barrios originated a while back as shantytowns, a clutter of simple shacks made of flattened oil drums, plywood, aluminum sheets, plastic tarps and whatever recycled construction materials the “developer” was able to put his hands on at the time. They first attracted the poorest of the poor, most often former Campesinos (farmers) who left the rural areas of their countries for the big city, in hope of escaping poverty and hunger. In Costa Rica, the capital is surrounded by such Precarios, neighborhoods that were once temporary as their name indicates, but that are now well established components of the Central Valley, where the big city of San José lies. Junior, a homeless man who calls the streets of Barrio Nuevo his home, is well aware of the challenges that every resident faces. He spends the day looking for work and caring for several of the furry wanderers that follow him around, wagging happily in the sticky tropical heat. One dog in particular is very attached to him. Bigotica, which roughly translates to “Costa Rican moustache”, decided that Junior needed a guardian angel and takes her role very seriously, never leaving his side. 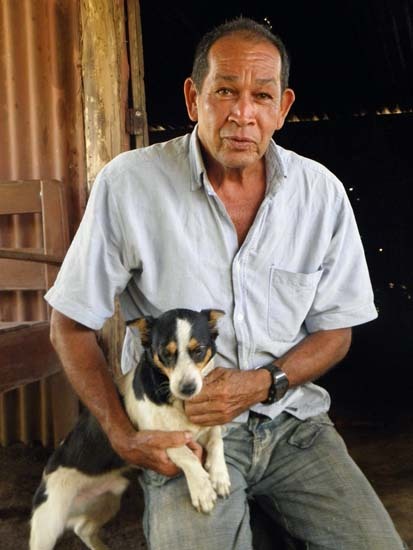 When Junior heard over the Coconut Telegraph – the grapevine, as it is nicknamed around here- that the SNIP Foundation and the Asociación Nacional Protectora de los Animales (ANPA) were organizing the first ever spay and neuter clinic in his neck of the woods, he made sure to be first in line on the morning of the event. “I know firsthand what the dogs have to do to stay alive here. We need a lot of things in Barrio Nuevo, but one thing we do not need is more puppies suffering in the streets”, says Junior as we check his beloved Bigotica in. At the end of a very long day, after many Juniors came and left cradling their spayed/neutered pets in their arms, we sat down feeling beat and yet proud of what we had accomplished. Now the challenge is to follow up, continuing with our outreach education efforts and promoting responsible ownership. To read the rest of SNIP’S newsletter, you can sign up to receive the newsletter at their website. Click here. The threat to the dolphins in India goes back much further though. In a very tragic turn of events, in 1998, a dolphinarium, Dolphin City, actually was set up in Chennai. CPREEC, Dr. Nanditha Krishna’s organization, and Blue Cross of India, of which Dr. Chinny Krishna was the Co-Founder and, at that time also the Vice Chairman, worked tirelessly to oppose it. Very sadly, the three dolphins who had been imported from Bulgaria and brought to the Chennai dolphinarium, died within a few short months. The dolphinarium denied that they had died, and the show went on with only sea lions. In reply to all questions, their story was that the dolphins were okay, and would soon be performing “when they were alright.” Dr. Chinny Krishna, of Blue Cross, persisted in telling the truth about the fate of the dolphins and in calling for an autopsy. Finally, a reporter from the Hindu confronted the dolphinarium’s management stating that if he was not allowed to see the dolphins, he would be forced to agree with Blue Cross’s statement that they had died. The truth of the dolphins’ deaths did come out. But, in the meantime, the dolphinarium had not only denied the dolphins’ deaths, but had ordered three more replacement dolphins from Bulgaria and arranged for their transport on a Russian plane, to be parachuted down from the plane on to the coast of Tamil Nadu, near Chennai. After the story broke in The Hindu, massive negative publicity erupted all over Chennai, forcing the dolphinarium to shut down — fortunately, this happened before they could import the three new dolphins. Sadly though, the sea lions, by this time, had also died. In the midst of this overwhelmingly tragic story for the animals, Dr. Nanditha Krishna recalls a somewhat lighter moment — someone arrived carrying a “whole box full of rupees.” They thought they could bribe the Krishnas to keep quiet and forget all about the dead dolphins. Of course, the people were sent away in short order, taking their overstuffed box of rupees with them. The Chennai dolphinarium was closed, thanks to the determined efforts of Blue Cross and CPREEC. Another attempt, just last year, to set up another one, in Mumbai, was also thwarted. 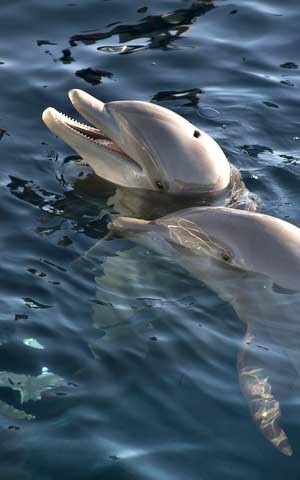 With the ban just announced, India will be permanently free of the cruelty inherent in keeping dolphins in captivity. The system of animal protection laws in India is perhaps the most enlightened anywhere in the world; it has been put together over decades by many far-sighted leaders across India in the animal welfare movement. Even more significantly, it flows from the deep reverence for animals which, over the millennia, has been and still is part of the fabric of Indian life and culture. In banning dolphinariums, India has, once again, led the way towards compassionate protection for animals. 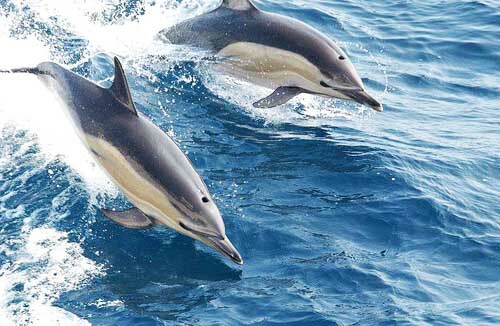 Dr. Nanditha Krishna recalled seeing dolphins in the wild, in the Andaman Sea, when she was traveling by ship from Singapore back to Chennai, India. She was captivated by them, and it is a memory that has stayed with her. Dr. Nanditha Krishna is the Honorary Director of the CPR Environmental and Education Centre (CPREEC). Dr. Chinny Krishna, who has devoted his life to the wellbeing of animals, serves as the Vice-Chairman of the Animal Welfare Board of India. Just this month, in an outstanding victory for dolphins, India has banned dolphinariums from being set up anywhere in India. On May 17, 2013, Ms. Jayanthi Natarajan, the Minister of Environment and Forests (MoEF), issued this decisive ban. This means that these beautiful, gentle creatures will not be exploited in India. 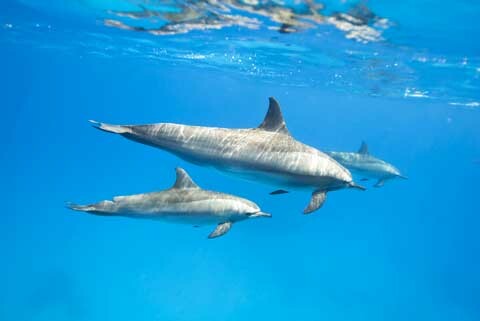 Dolphins that are held captive in dolphinariums are wild animals who have been taken from their lives of freedom in the oceans to be used for human entertainment. Other countries are likely to follow this forward-looking, compassionate stand. In accordance with the Wildlife Protection Act, 1972, all zoos in India, a category which would include dolphinariums, must obtain advance permission from the Central Zoo Authority before they can be established. 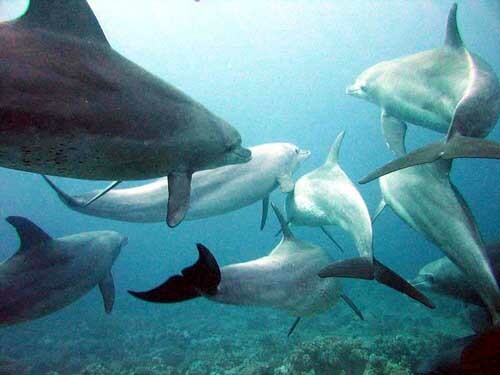 Mr. Bonal goes on to state that dolphins are highly intelligent, and that it is morally unacceptable to use them for entertainment; also that they do not survive well in captivity and that they undergo extreme distress when captive. Therefore on all these grounds, the Ministry of Environment and Forests will not allow any dolphinariums in India. Dr. Nanditha Krishna served two three-year terms on the Central Zoo Authority (CZA) and has over the years been in on-going communication with Mr. Bonal and the earlier Member Secretaries of the CZA. When the alarming possibility first surfaced around a year ago of a dolphinarium in Kerala, she wrote to Dr. Tishya Chatterji, the then Secretary of the Ministry of Environment and Forests, Government of India, and Mr. Bonal. Both replied that the Ministry and the Central Zoo Authority would not give permission for these dolphinariums to be set up. She wrote back that she was very glad to hear that. Mr. Bonal also sent a statement to that effect to the Principal Chief Conservator of Forests in Kerala, telling him to ensure that no dolphinarium came up in Kerala. Finally, in view of the growing demand to ban all dolphinariums, the Central Zoo Authority issued the ban order. 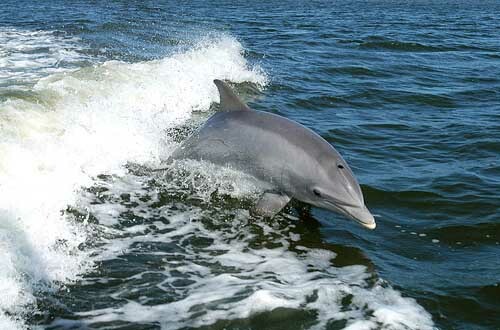 This is a bold step forward for freedom for dolphins and other cetaceans. Earlier, in January, 2013, the Animal Welfare Board of India (AWBI) had issued an advisory, signed by Dr. Kharb, Chairman of the AWBI, much to the same point, strongly opposing the setting up of dolphinariums in India. All performing animals must be registered in advance with the AWBI, and the advisory stated that it will not give any permission for dolphinariums, on the grounds that they violate the Prevention of Cruelty to Animals Act, 1960. Furthermore, the AWBI advisory goes on, there is no educational benefit to seeing cetaceans in captivity. This can only “mis-educate” the public into not understanding that dolphins are wild animals that belong in the wild. In accordance with India’s long history of appreciation and respect for animals, a great many Indian groups and individuals worked very hard to keep dolphinariums out of India. 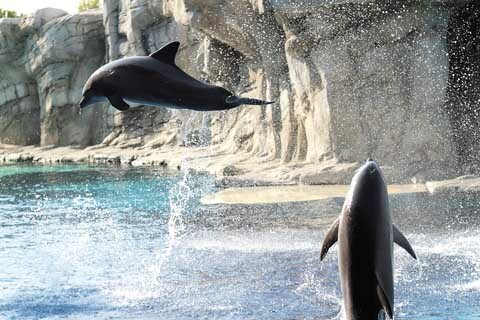 FIAPO, the Federation of Indian Animal Protection Organizations, along with its partners, Born Free Foundation, Global Green Grants Fund, Earth Island Institute’s Dolphin Project, and Wildlife Rescue and Rehabilitation Centre, have also been campaigning against allowing dolphinariums into India. They have brought public attention to this issue, holding press conferences in Delhi and in Kerala and were very pleased at the announcement of the ban. Humane Society International has also been actively engaged, non-stop, in fighting against dolphinariums. It was in the spring of 2012 that the Mayor of Kochi, in Kerala, made the announcement, startling to many, that the city of Kochi was planning to open a dolphinarium. This sparked animal welfare groups throughout India to work diligently on behalf of the dolphins since that moment. This success is the result of the work of everyone who took part. 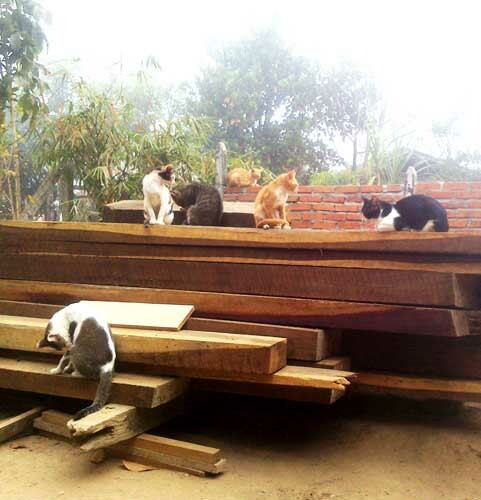 Ko Cho, who has been rescuing, feeding, and caring for community cats in Myanmar (Burma) for several years, now has a good safe place for some of them to live, in Uranus, his lumber business. 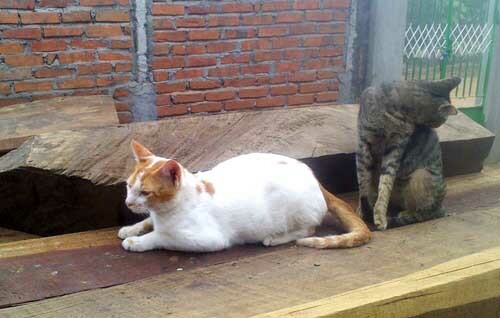 We wish him much success with his business, which will help him in his work with the cats. Ko Cho is the only animal rescuer we are aware of in Myanmar. He also recently rescued and released two young crows, who have stayed around with their cat friends. She isn’t smiling yet, but she’s about to. Smiley was a special dog. 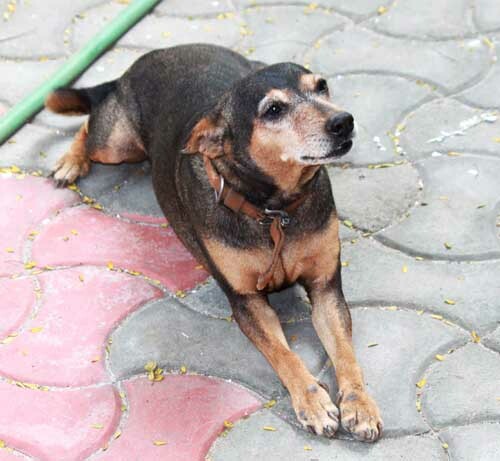 All dogs are special, of course, including all the many dogs who have found their way from the streets of Chennai to Dr. Chinny Krishna’s factory, and then from there many have found their way into the home of Dr. Nanditha and Dr. Chinny Krishna. She was about 7 or 8 when he took her home from his factory in 2006, and she lived to be around fifteen, always active, happy, and in good health. Even on the morning of May 13, nothing seemed out of the ordinary. She passed away that afternoon and has gone on to her next adventure, carrying her smile with her to light the lives of friends she meets along the way. May Smiley rest in peace as she brings peace to others. Little black haired Haa Sip (50 in Thai) left his mark on history (and the vets left a mark on him!) when he became the 50,000th animal to be sterilized since Soi Dog started in late 2003. Performing the historic deed were two of our resident veterinarians Dr Su and Dr Che. Haa Sip is from Thepkasatri district in Phuket. Soi Dog Vice-President John Dalley said the Foundation hopes at its current rate to sterilize 100,000 animals in around three years time. In its first year Soi Dog sterilized just over 1000 animals. Soi Dog is discussing with the Department of Livestock in Bangkok introducing a national programme based on Soi Dog’s activities on Phuket. Thailand has pledged to eradicate rabies by 2020 in accordance with ASEAN agreements. Large populations of unvaccinated and unsterilized street dogs makes the eradication of rabies virtually impossible and we are hoping that a national programme can be established in the interest of both animal and human welfare. Soy Dog dedicated this newsletter to Jeanne Marchig, a generous supporter of Soi Dog Foundation and numerous small animal charities throughout the world, who passed away in early May of this year. This is Part Two; to read Part One first, click here. While the marathon of talks was ongoing, Blue Cross was taking steps to get ready to receive the puppies. Laboratory-bred puppies would have no immunity to real-world conditions, so great care must be taken not to expose them to any germs commonly carried by dogs. For this reason, they couldn’t be kept on the grounds of a shelter, neither at Blue Cross nor at PFA Chennai. Even transportation for them would have to be in sanitized vehicles. Blue Cross runs a 24 hour a day regular ambulance service for injured street dogs, with nearly a dozen ambulances on hand. They took the two largest ambulances out of service for two weeks to fumigate them, disinfect them, and scrub them from top to toe. Then they repainted the insides of the ambulances. No germ was left alive. At 4pm on Friday, Dawn Williams, representative of Blue Cross, went to the Quarantine Station, with papers in hand – the letter from ADVINUS, plus the notification from the Ministry of Environment and Forests authorizing the puppies to be handed over to the AWBI. This was still not enough, however. He was informed that since Customs had sent the puppies to the Quarantine Station, only Customs could get them released. Dr. Krishna called the Chief Customs Officer for the whole of India, who was in a meeting in Delhi. By 7pm, he had given his okay, and by 8pm, Dawn Williams was back at the Quarantine Station with the additional papers. Everything seemed fine then, except that it was after dark, and it would be best to come back in the morning. The indefatigable Dawn Williams returned at 8 am the next morning, which was Saturday, with the two ambulances to get the puppies. At 9:45 am, someone showed up, but nothing further happened, and at noon, he was still waiting. At one pm, the Quarantine Officer appeared, and announced that he would need permission from the Minister of Agriculture to release the puppies. Dr. Krishna made another round of 100 phone calls, trying to reach someone — anyone who could do something. At last, in desperation, he called Mr. Doulat Jain, a former Vice Chairman of the AWBI. An industrialist who is still a member of the AWBI, he was kind enough to contact the Agriculture Minister of India, who then instructed that the puppies be released. By then, it was 5 pm on Saturday afternoon. At 7pm, the puppies were at long last turned over to Dawn Williams. 25 of the puppies were immediately given to Dr. Shiranee Periera of People for Animals, Chennai, who adopted all of them out, on the spot, to pre-screened families. This took place just outside the doors of the Quarantine Office. The other 45, under the auspices of Blue Cross, were loaded into the immaculate ambulances and made their way to the home of Dr. Nanditha and Dr. Chinny Krishna. At 7:30 pm, the puppies arrived on a comfortably cool South India January evening, where they were kept in an enclosed garden that had been carefully cleaned and disinfected, outside one of the compound buildings. Soon 100 people, buzzing with excitement converged on the scene, all anxious to get a glimpse of the puppies. There were forty-five pre-screened, qualified families. All had to have a family vet, and had to commit to getting their adopted puppies vaccinated and spayed or neutered. Between 7:30 and 10pm that evening 28 puppies were adopted. No adoption fees were charged, but about half the families gave donations to Blue Cross. The following night, Sunday, the 17 remaining puppies found homes. It was a happy occasion for both people and puppies. Despite the joy of this truly happy event, Dr. Nanditha and Dr. Chinny Krishna noted that some of the 45 puppies could not bark. They seemed to have been debarked. 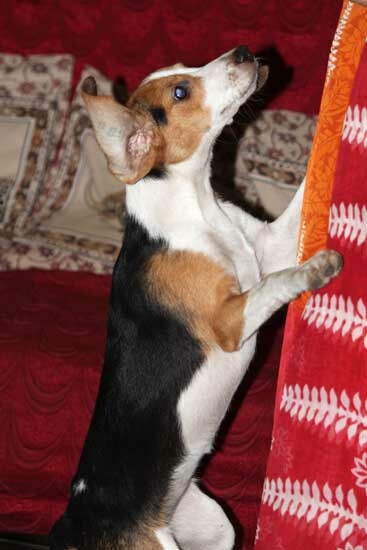 Also, they were not normal size and seemed to have been bred intentionally to be dwarf beagles. Moksha, Mukti, and all the others, have large numbers tattooed in their ears. The numbers are an 8, followed by 6 digits. Even if one assumes that the 8 is a batch number, that still means that the number of beagle puppies bred in the lab they came from is in the six figures. The beagle pups were six months old by this time. They all, of course, needed housetraining. Despite having been kept caged the entire time, Dr. Chinny Krishna says that every dog was “so friendly.” These 70 innocent beagle puppies will now be blessed with a chance to have long, happy lives, and Moksha and Mukti can play with Ruffles. Following the great love and care she was given, Mukti’s spinal problem vanished, as if it had never been. This was a bright spot in a lengthy battle. The struggle continues in the long fight to arrive at a moment when all animals everywhere in the world are free from the threat of being used in laboratories.